Take advantage of one of these great offers and contact us today. The above packages are on offer to the UK only, and include design, print and delivery. Launching on Monday 30 March 2015, there is no expiry date to these offers, so get in touch when you’re ready to discuss your project. 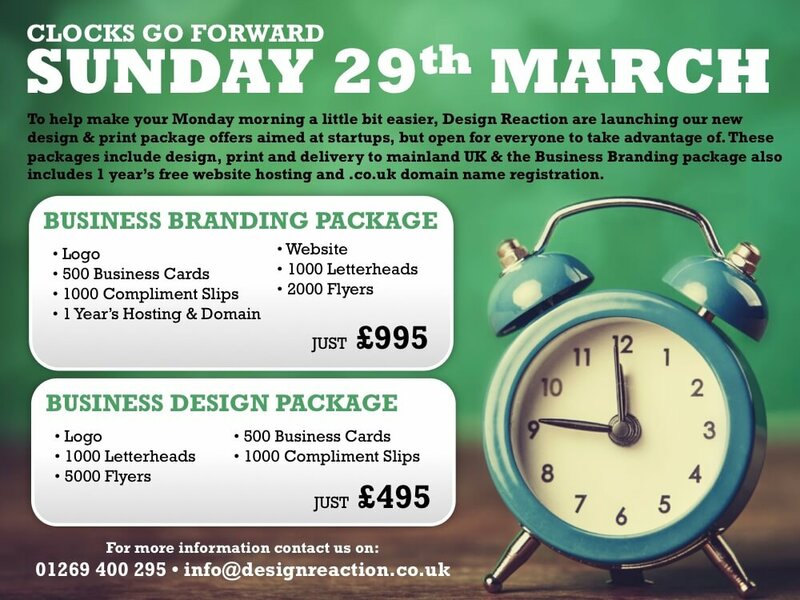 The Business Design Package also includes a free .co.uk domain name registration and 1 year’s hosting for free. Both packages include a logo design, based on the feedback of your business, likes and dislikes, you will receive 2 logo designs, with 2 revisions to your preferred design. You will then receive the final design as a .JPEG (a pixel based image for you to use on documents and other media such as social media channels, word, powerpoint etc.) and .EPS (a vector file to pass on to printers for future use) file. Both packages include 500 full colour, double sided business cards printed on thick card of 450gsm with a Matt lamination for a professional finish. Tying in with your new logo, we will provide 1 business card design with your details where you will then have 1 revision to the design. When the design is signed off, it will be sent to print ready for delivery. This includes 500 business cards of one type, you can’t split it to 250 of one name and 250 of another name. If you require extra prints for another person, just get in touch for a great deal. Both packages include 1000 full colour, single sided letterheads printed on 120gsm paper for a great finishing touch. Tying in with your logo and business card brand, we will provide 1 letterhead design with your company details where you will then have 1 revision to the design. Both packages include 1000 full colour, single sided compliment slips printed on 120gsm paper like the letterheads. Following your letterhead, we will provide 1 compliment slip design with your company details where you will then have 1 revision to the design. The Business Branding Package includes 2000 A5 flyers, while the Business Design Package includes 5000 A5 flyers. Design Reaction will provide 1 design for a double sided A5 flyer with 1 revision. The flyer will be printed both sides in full colour on to 150gsm silk stock. You will need to provide us with as much information as possible and imagery to go on the flyer. A designer will be available by phone to discuss your design. The Business Branding Package includes a website that will follow in style of your logo and printed material. The site will be set up on WordPress so that you will have full access to log in and change text and imagery as and when needed. We will build the site to include up to 6 pages: Home, About, Contact plus up to three service pages. If you require more pages, please speak to us to arrange before the design and build begins. The website includes a contact form on the contact page. Please note that if you require an e-commerce site, although we have the capability of providing this it is not included in this package. Your new website under the Business Branding Package also includes 1 year’s free hosting and .co.uk domain name registration. After your first year there will be an on-going charge of £120 per year to cover the cost of the above. If you require emails set up, it will also be covered under this charge. So what are you waiting for? Contact Design Reaction on 01269 400 295 or email us on info@designreaction.co.uk to place your order.